Ivelisse Pabon de Landron first learned doll making from her mother. Years later, she went on to study with older doll makers on the island of Puerto Rico. The skills they passed on were honed during times of hardship, when many rural people could not afford to buy the necessary things to survive, let alone provide toys for their children. Mothers taught their daughters the craft of doll making using socks, old garments, corn husks, and banana leaves. Ivelisse recalls the tradition of making handmade gifts in celebration of Three Kings Day, "This tradition is still practiced today. An empty shoe box with hay inside would be placed under the bed. The child would go to sleep and when morning came, the shoe box was filled with a gift, in this case, a doll. It is said that the camels ate the hay and the gift was left behind by the Three Wise Men.-. In the fall of 2010, Ivelisse was awarded an MCC Traditional Arts Apprenticeship to pass on her doll-making skills to Jamielette Figueroa. Jamielette is enthusiastic, focused, and pleased to be working with a master doll maker who shares her same heritage, Spanish, language, and spirituality. 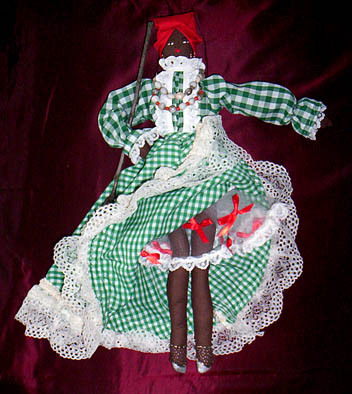 In addition to working on the technical craft of doll making -- designing, drawing, paper pattern making, cutting, hand stitching, and construction of dolls -- the pair will create characters of Puerto Rican folklore such as the Dona Nana, jibaros, midwives, candy makers, and bomba & plena dancers.